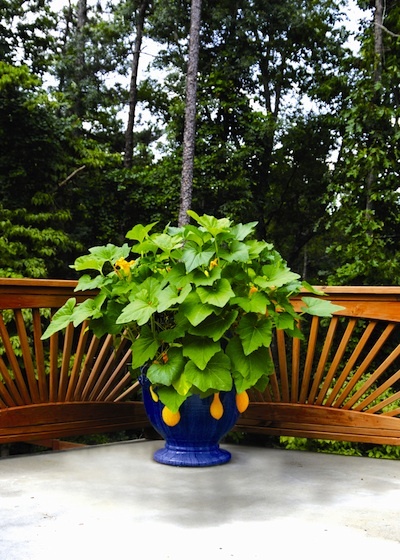 Yellow squash (also called summer or crooked neck squash) looks fabulous all by itself in this huge, blue container. I was quite surprised at how fast it grew - from a seedling to the size shown in only six weeks! It was the first vegetable to bear fruit in my entire garden, but lasted only about two or three months. However, it produced quite a bit of squash. I planted the same squash in mixed containers at the same time. It was much more crowded but bore fruit in about the same time period: six weeks. The fruit was smaller, and there wasn’t as much of it, but it tasted good all the same. Be sure to look under the leaves for the vegetables because they often hide! This planting is a good example of how easy many vegetables are when planted in quite large containers. And, if you plant them in a fabulous container like this one, they are worthy of the nicest home or patio. Season: When temperatures range from 50 to 90 degrees. Optimum temperatures are 65 to 75 degrees. Lifespan: Two to three months in this container. Care: Feed on planting day with a slow-release fertilizer. I trimmed the vine occasionally to keep it looking even. Water thoroughly, if the plants show signs of wilt or the soil feels dry when you push your fingertip into the potting mix. I watered this one every day (after it was about a month old) in midsummer and every other day in cooler weather. Troubleshooting: Downy mildew is a problem that is hard to control. It devastated this plant before I knew what had hit it. Once I understood how to control this pest, I didn’t lose any more plants to it. It requires weekly spraying with a product used to prevent infection before it occurs. These products do not cure. When shopping at a local garden center ask for the least toxic pesticide (approved for vegetables) for mildew. Squashes are also sometimes bothered by squash vine borers, which bore into the stem and eat the stem from the inside out. If you see a small, black dot on the stem, cut open the stem and remove the bug. Planting Plan: Easy. Simply plant one plant in the middle of a large pot. Container: This container is HUGE - I don’t think the photo shows how big Campania International’s Anduze Urn (27”W X 31”H) is. It is one of my largest, weighing in at 150 pounds. For best results, stick to larger containers (at least 18-inch diameter) for this type of squash. Best Time to Pick: When squash are small and skin is still soft. They are much more tender when small, but if you forget and leave them until the warts form, they are still edible if you cook them a little longer.